I'm always intrigued by countries outside of Italy experimenting with native Italian grapes in different terroirs. 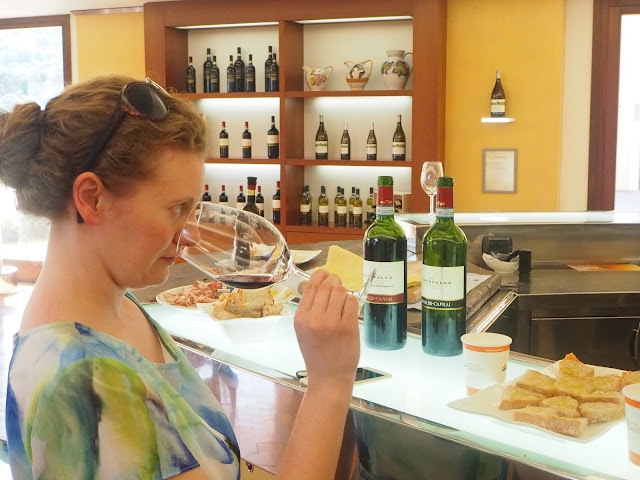 I met an Australia winelover, Louise Rhodes, from networking online and I thought it would be interesting to receive her perspective on Italian grapes growing in Australia. 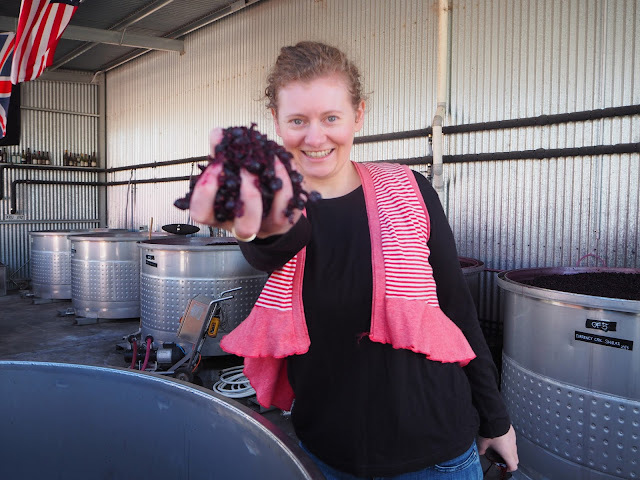 Louise moved from Sydney to McLaren Vale in Australia in 2013 and was motivated by her surroundings to start her own wine blog, Willunga Wino. 1) How long have you been writing WillungaWino and what got you started in the wine industry? My earliest wine memories are joining my dad being visited at home by wineries who took us through in home tastings. I used to beg dad to get the sweet reislings and dessert wines! My love of wine grew from there. When I met Mr Wino, he was studing accounting, which didn't work out after he graduated so he re-enrolled in winemaking and started work as a wine buyer, then did a few vintages, and then was offered a job blending wine for his company in McLaren Vale. The move sparked the start of Willunga Wino in 2013, I was just so inspired by the food, wine and landscapes around me. Now Mr Wino works direct for a small winery as Assistant Winemaker, and we are just starting our own wine label, Aphelion Wine. 2) What are some of your favorite wines within Australia and the rest of the world? When it comes to Italian wines do you have favorites? The Kalleske Moppa Barossa Valley Shiraz 2008 is a firm favourite of mine, every time I smell it I rave about it. I love Pol Roger Winston Churchill 2002 because that's the wine Mr Wino proposed to me with. When it comes to Italian wines, I love Umbrian Sagrantino, Piedmontese Barolo and Dolcetto, and Prosecco! 3) What is the demand and market like for Italian wine in not only McLaren Vale, but the rest of Australia? 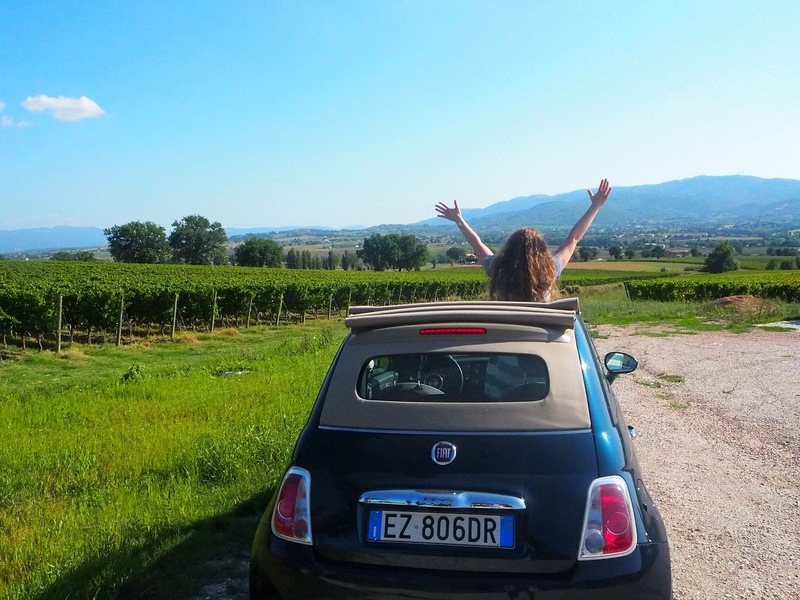 The most famous Italian wines in Australia are Prosecco and Chianti. Then amongst people who know a little about wine, Fiano, Vermentino, Barbera, Nebbiolo, Nero d'Avola are also well known. In restaurants and bars these kinds of Italian wines are very popular. 4) I'm not familiar much with Australian producers using Italian grapes. Do you have knowledge in this area and what is successful there? Australia has no native grapes, and our climate and geology varies so much that we can grow almost any variety here. McLaren Vale has a very Mediterranean climate, and so lends itself to Italian varietals, and more are being planted as our climate changes. Some popularly grown local grapes are Fiano, Vermentino, Barbera, Nebbiolo, Nero d'Avola and Sagrantino are all grown here, and more, with new varieties being planted all the time. We are so pleased with the Sagrantino grown here that it is the signature variety of our new wine label! Locally, we love to experiment, and try something new, wine drinkers in McLaren Vale are adventurous, and Italian varieties are delicious with our "modern Australian" food and warm climate.